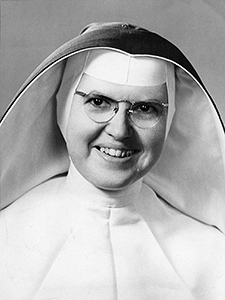 Sister Mary Nona McGreal, O.P., was born to Thomas Edward and Margaret (Kehoe) McGreal April, 20th, 1914, in Waukegan, Illinois. She graduated from Immaculate Conception School (1927) and Holy Child Academy (1931), both in Waukegan. In 1942, she received a B.A. in English from Rosary College (now Dominican University) in River Forest, Illinois. She received her M.A. in Education (1946) and her Ph.D. (1951) from Catholic University of America, Washington, D.C. The title of her dissertation is: The role of a teaching sisterhood in American education. She made her first religious profession as a Sinsinawa Dominican Sister March 8, 1933 and her final profession August 5th, 1936. Sister Mary Nona was the President of Edgewood College from 1950-1967. During her tenure, she oversaw the construction of six buildings: The Campus School, Mazzuchelli Biology Station, Regina Hall, the gym (now called the Edgedome), Weber Hall, and DeRicci Hall. Sister Mary Nona was an author of several books, including a biography of the venerable Father Samuel Mazzuchelli, O.P. She co-authored (along with Sister Mary Joan Smith), the highly influential Guiding growth in Christian social living: a curriculum for the elementary school, during the 1940’s. From 1977 to 1984, Sister Mary Nona worked both in Rome and in the United States preparing the official Positio, the comprehensive summary of all the documentation regarding the Cause for Beatification of Father Samuel Mazzuchelli, O.P. Sister Mary Nona died March 20, 2013 at St. Dominic Villa, Sinsinawa, Wisconsin.